The Yahapalanaya Government which came to power pledging to rid abuse appears to be following in the footsteps of the former regime, with ministers in the current government being involved in various forms of misuse which has resulted in the country losing millions but the ministers earning in millions. 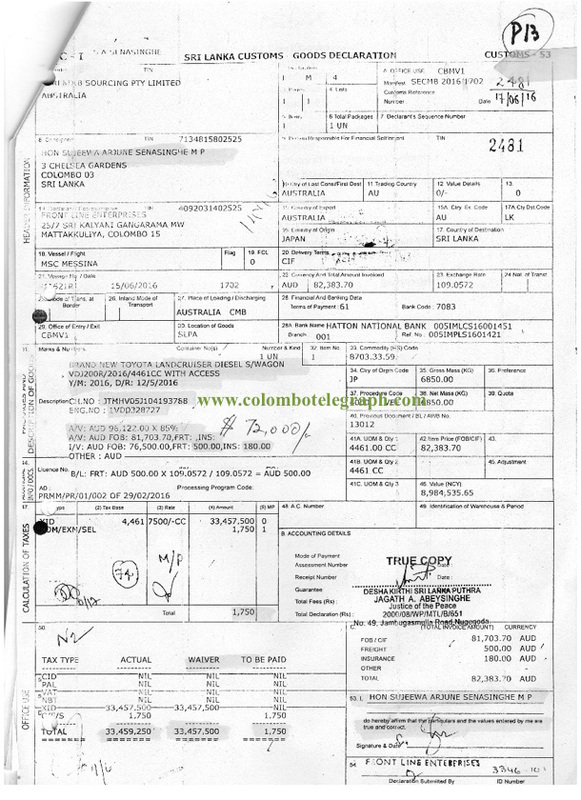 Deputy Minister of International Trade Sujeewa Senasinghe, who was a vociferous campaigner against the corruption of the Mahinda Rajapaksa led former regime has been accused of selling his duty free car permit. On June 17, 2016, a Toyota Land Cruiser was imported by Senasinghe using his duty free car permit and was registered with the Commissioner of Motor Traffic on July 20, 2016 with the vehicle being transferred to the name of the vehicle permit buyer Ali Akbar Salehbhai on the same day. This came to light when the Duty Free Vehicle Permit Abuse case was taken up at the Supreme Court recently. The case is filed by rights activist Nagananda Kodituwakku. According to Kodituwakku, the permits are sold at 25 million rupees or more in the open market by MPs, with buyers permitted to import any vehicle of their choice with no limitation of the engine capacity. Already over 34 units of Toyota Land Cruiser vehicles have been imported abusing these permits, with entire tax element exempted and only data entry fee of Rs 1750/- charged by Customs. The case was taken up after Chief Justice K. Sripavan who took up the car permit abuse issue in late July, permitted Kodituwakku to make a written submission over the alleged car permit abuse by MPs. When the case was taken up this month, Kodituwakku supported his argument with documentary evidence which showed how MPs were abusing the duty free vehicle permits. He requested the Supreme Court to provide a full bench hearing on the basis that it was a case of national importance. 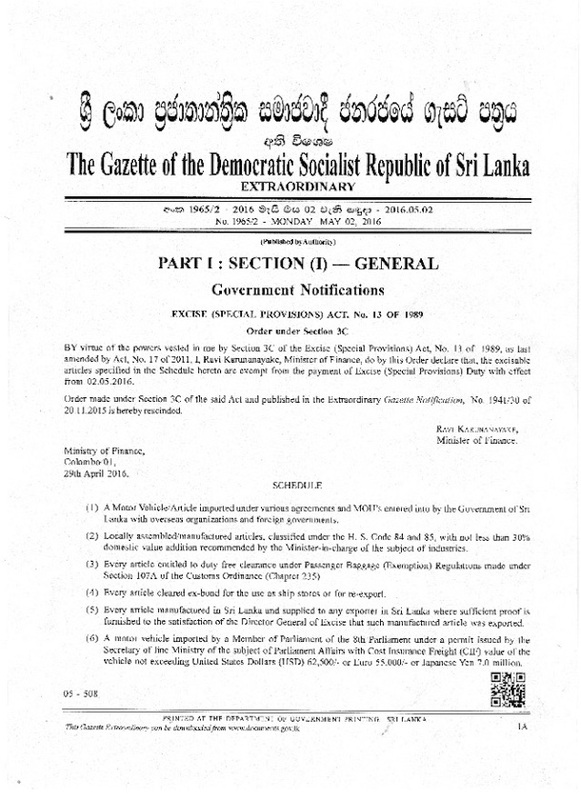 After coming to power, the Maithripala Sirisena – Ranil Wickremesinghe led administration, having appraised the colossal losses sustained under the Mahinda Rajapaksa administration, in its first financial policy statement presented in the parliament on November 20, 2015 declared that government had incurred a heavy loss of over 40 billion rupees on tax free car permits, therefore the administration proposed to abolish all such permits altogether including the permits issued to MPs which was openly abused by them. 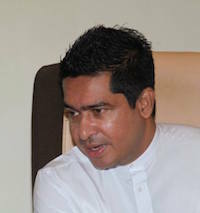 However, few months later, the same Finance Minister Ravi Karunanayake who presented the initial fiscal policy statement made a U turn and made an order (published in the Gazette (No 1965/2 of 02nd May 2016) under Sec 3C of Excise (Special Provisions) Act exempting levies on motor vehicles imported by MPs with CIF value up to US $ 62,500/. However, as required by the law to protect the government revenue, there was no condition whatsoever imposed against the abuse of such permits, allowing MPs to sell their permits in the open market. 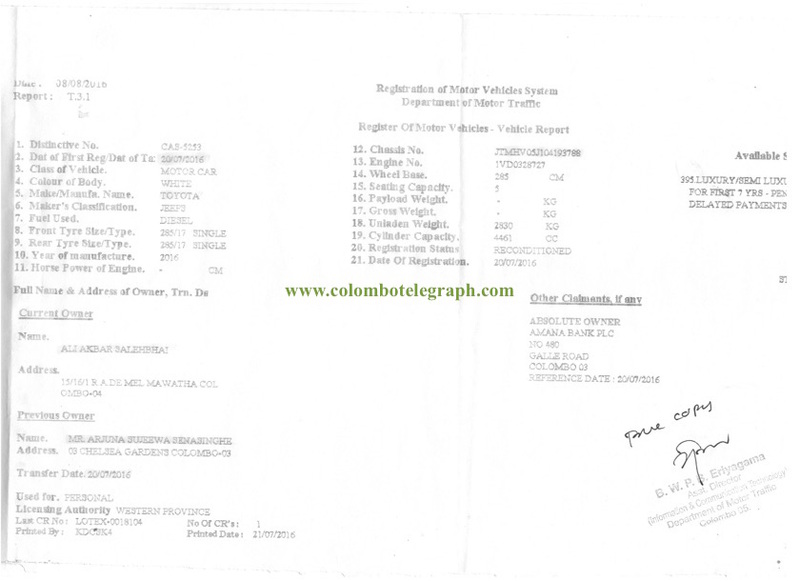 The request for registration information of the vehicles already imported on these permits by the rights activist, presented to the Commissioner General of Motor Traffic, demonstrates that for each vehicle, the government had incurred a loss of over 33.5 million rupees and except one US made Hummer vehicle, all other 33 vehicles are Toyota Land Cruiser Diesel Jeeps, a very popular vehicle with a high demand in the high end domestic market. The tax-free car permits have been issued to all MPs under Section 3C of Excise (Special Provisions) Law No 8 of 1994. This law empowers the Minister of Finance to exempt from charging of levies on any goods, having regard to the economic development of the country, with an Order in that regard published in the gazette, subject to such conditions as may be specified in that Order by the Minister. The activist emphasized the importance of restoring the rule of law in the country where people have been ruthlessly betrayed by the MPs who had openly sold their tax-free permits for unjust enrichment and therefore action must be taken to deal with them appropriately. The activist told the Court that the current regime promised people to abandon the Rajapaksa regime’s bad policies but instead they have surreptitiously abandoned their promises and now continue with the same policies causing colossal losses to the country’s revenue and tremendous hardship to the people. Despite the evidence submitted by the rights activist, the Supreme Court declined to intervene against the tax-free permit abuse and grant leave to proceed to the activist’s right application on the basis that the permits have been issued with no condition specifically mentioning against selling such permits to 3rd parties. Amended the law, for anyone who have sold permits , let them pay 10 % of the profit to a worthy cause like the cancer Hospital , and let the buyer pay the duty and levies in five years installment. You can never find a single nation in the world with zero corruption, only with minimum . come up with an alternative ,otherwise bring the dead from their graves also who have sold their permits. Who says our judiciary is independent and fearless. A pack of dummies can carry out this kind of judicial rulings. True to his appointment this Mr.[Edited out] has conducted an Internal Trade with his permit. From Trinity or TINTY college?????????? ?